Frictionless retail. Computer vision specialist Scandit, with clients such as Sephora and Louis Vuitton, showed that any retailer can offer a grab-and-go experience like Amazon Go. Scandit showed customers locating items, product content, ratings, reviews, and personalized deals. The solution enables store associates to use their own mobile devices to quickly find click-and-collect orders and easily complete inventory management tasks. You can find out more about frictionless retail in Forrester’s digital store playbook here. CX automation. I’ve long dismissed as wishful thinking the idea that machines can predictably read a shopper’s mood by scanning his or her face. Imagine my surprise when the demonstration system at chip maker Intel’s stand registered “skepticism,” then “amusement.” Mood Media, WestRock, Instorescreen, and Intel collaborated to show how retailers can use optical sensors, gathering anonymous shopper-specific data and providing real-time shopper insights on the effectiveness of in-store tactics. You can find more about in-store technology and CX here. Supply chain visibility. Retailers working on digitizing their supply chains should look out for our upcoming research on intelligent packaging and its impact on customer experience, from the store back to the manufacturer. In the meantime, I was delighted with Panasonic’s Visual Sort Assist system. It recognizes the faces of authorized dispatchers. It improves speed and accuracy in processes, such as cross docking, to ensure prompt online order fulfillment. It supervises outbound load building, ensuring that the right pallet loads are on the right truck in the right sequence. Panasonic and retail planning leader JDA announced collaboration on converged planning and execution. It will include production, supply-and-demand forecasting, and store inventory management. 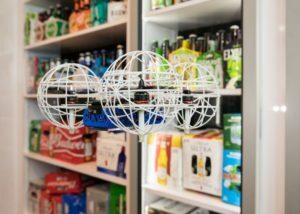 I loved the demonstration of Pensa’s gentle autonomous flying drone, “learning by looking” at opportunities for improved store operations efficiency. Intelligence at the edge of the retail enterprise. Moore’s law means — crudely — that chip capacity will always grow faster than network capacity. I saw a range of apps processing images and data on powerful new in-store devices, sensing and responding instantly to local changing customer moods and behavior, thereby reinvigorating brick-and-mortar retail. You might like to read more of Forrester’s research on edge technology here. Programmable store infrastructure. I was wondering: If retailers deploy more powerful devices and apps to stores, how would they manage them? Then I found Cisco DevNet. It implements, manages, and operates apps and devices to provide the right retail experience in the store. These technologies, with local processing and immediacy, offer the store a competitive edge over online retail and lend conventional retailers a potential competitive advantage over Amazon. I hope I’ve given you a feeling for the buzz of NRF 2019 and whetted your appetite for our upcoming research this year. What caught your eye at the show? Till next time!